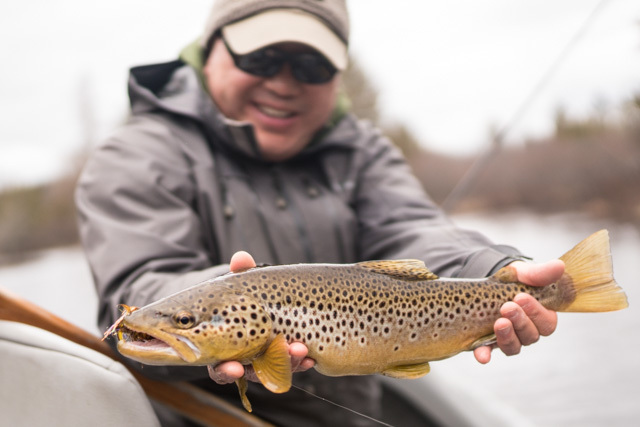 Manistee River Trout fishing report for early Season Trout is looking good. Water temps are still cold so Streamers are the name of the game. But water is up and has some color so really looks good for throwing the big bugs. Pack your favorite 6 and 7 weight rods , with a Cold Water 25 or 30 , in the 200 or 250 grain variety and start throwing the big flies around. Brown Trout were on the feed the other day, with log jams and any structure being the key to success. The inside corner kill spots did not have fish on them, you had to hunt structure to find them, with still snow in the woods and melting water temps are still cold. So fish wanted the strip to be slow. Baitfish patterns in white/copper and yellow/olive did best for us the other day. Felt too early for the lamprey bite to be much good, but sculpin / baitfish patterns did just fine. We should be posting the Hat Trick Streamer this week to our YouTube Channel, that is great early season pattern and has worked well on the Pine River during the summer. Trout fishing on the Upper Manistee can be a little dicey early but we did break into Yellow Trees, with a hard pack snow inside the pine trees that was easy to drive on. But that snow can get soft this week, so bring your 4×4. Make sure to pack a saw this year especially early, as trees are still falling. Our guides have had a few fun experiences already. Be careful! Give Cherie a call 231-228-7135 for booking information on Guide Trips and to get a spring streamer trip in the books. We are still guiding Steelhead below Tippy and on the Pere Marquette, but our focus will be soon changing to all Trout fishing. Also follow us on Facebook and Twitter for additional photo’s, videos, and links to more fishing related articles.